HÀ NỘI – General Secretary of the Communist Party of Việt Nam (CPV) Nguyễn Phú Trọng hosted a reception in Hà Nội yesterday for Song Tao, special envoy of General Secretary of the Communist Party of China (CPC) Xi Jinping. General Secretary Trọng extended his congratulations on the success of the 19th CPC National Congress and highly praised the achievements of the Party, State and people of China during the cause of building socialism with Chinese characteristics. The Party chief voiced his belief that under the leadership of the CPC Central Committee led by General Secretary Xi Jinping, the Chinese people would certainly complete the targets set at the 19th CPC National Congress. Việt Nam always attaches importance to its relations with China and sincerely wants to develop the traditional friendship and comprehensive strategic cooperative partnership with the country for mutual benefit, he said. General Secretary Trọng suggested the two sides work closely together to implement common perceptions reached by senior leaders of the two Parties and countries, and their signed agreements. He also stressed that Việt Nam is looking forward to the upcoming State-level visit to Việt Nam by Party General Secretary and President Xi Jinping as well as his attendance at the APEC Economic Leaders’ Week. Song Tao, who is also a member of the CPC Central Committee and head of the CPC Central Committee’s International Liaison Department, said the Chinese Party, Government and people always want and stand ready to collaborate with their Vietnamese counterparts to continuously elevate the traditional friendship and comprehensive strategic co-operative partnership to new heights. He briefed the Vietnamese Party leader on the outcomes of the 19th CPC National Congress as well as China’s major development policies and orientations towards socialist modernisation. The Party, State and people of China and General Secretary Xi Jinping attach great importance to developing their friendship and co-operation with Việt Nam, and hope that the two sides will increase strategic exchange, mutual political trust and practical cooperation in different fields, thus bringing the bilateral relationship into a new period of stable development. 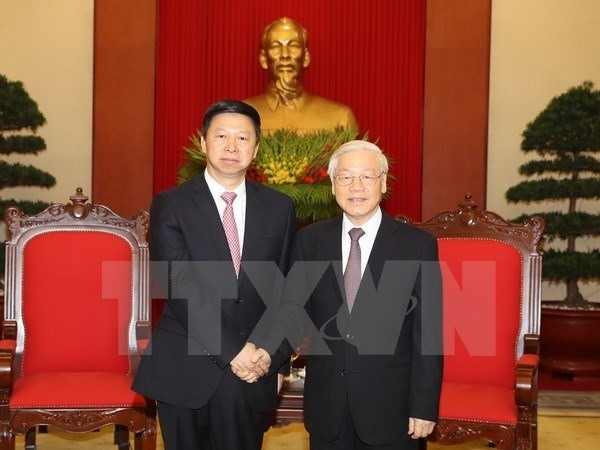 Later the same day, Trần Quốc Vượng, Politburo member, permanent member of the CPV Central Committee’s Secretariat and head of the CPV Central Committee’s Inspection Commission, received Song Tao. The Chinese official proposed measures to promote the relationship between the two Parties and countries by increasing the exchange of delegations at all levels and upholding the achievements of their existing cooperation mechanisms. He expressed his hope that the two sides will enhance mutual political trust, and theoretical, strategic and friendly exchanges, in an effort to lift relations between the two Parties and nations to a new level. For his part, Vượng congratulated the CPC on the successful organisation of its 19th National Congress and expressed his hope that the CPC will lead the Chinese people to reap more achievements in the new period. He called on the two sides to make concerted efforts to effectively implement common perceptions and agreements reached by the two countries, and strengthen relations between the two Parties and countries in a stable manner.